The Morning Show with Ken Lanphear on WKZO AM 590 and FM 106.9 talks with Firefighter Michael McLeieer of E.S.C.A.P.E. 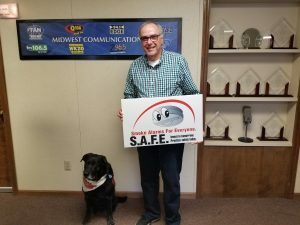 and the Michigan State Firemen’s Association about a new statewide campaign that will prevent home fires, connect families with resources and keep Michiganders S.A.F.E.! If you have questions about smoke alarms, carbon monoxide alarms or fire safety, please contact your local fire department, call toll free 1-844-978-4400 or email escape@wotv4women.com!